Oh, and also read right away this somewhat shorter than normal episode of Carillon News. Lots of reading and viewing pleasure. 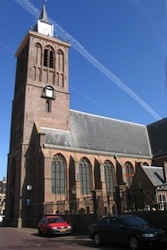 During the merger preparations of the municipalities Schermer, Graft-De Rijp and Alkmaar in 2014 the undersigned, the town carillonneur of Alkmaar, made the suggestion that the autonomous municipality Graft-De Rijp, as a last act with lasting physical result, could put a carillon in the tower of the Grote Kerk at De Rijp. Although the municipality was positive towards this plan they could not and did not want to make the funds available. It then followed that seven notable residents of De Rijp took the initiative to set up Foundation Carillon De Rijp with the objective to install a carillon in the tower of the Grote Kerk. It was recently announced that the Foundation has gathered the necessary financial resources and ordered the bell founder Simon Laudy of Bell and Art Foundry Reiderland in Beerta to carry out the work. If everything goes to plan, the carillon (3½ octave based on Bes1) will hang in the tower ready for use in December 2017. After completion the carillon will be offered as a gift from the Foundation and the village community Rijper to the Municipality of Alkmaar. The University of Groningen did not let the twentieth jubileum of university carilloneur Auke de Boer go unnoticed. The University newspaper asked the carilloneur to play a program of requests. The students reacted enthusiastically and submitted 50 requests via a website set up by the newspaper. 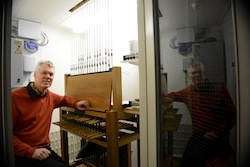 De Boer chose fourteen numbers to play on the University carillon of 28 major-third bells on December 6th. These included Led Zeppelin’s 'Stairway to Heaven’, the Pokemon-tune, a classic work like ‘Clair de lune’ from Debussy and 'Born in the USA’ by Bruce Springsteen. Of course, as ‘Bohemian Rhapsody’ was a hot favourite the carilloneur now has a nickname ‘Auke “Freddy” de Boer’.